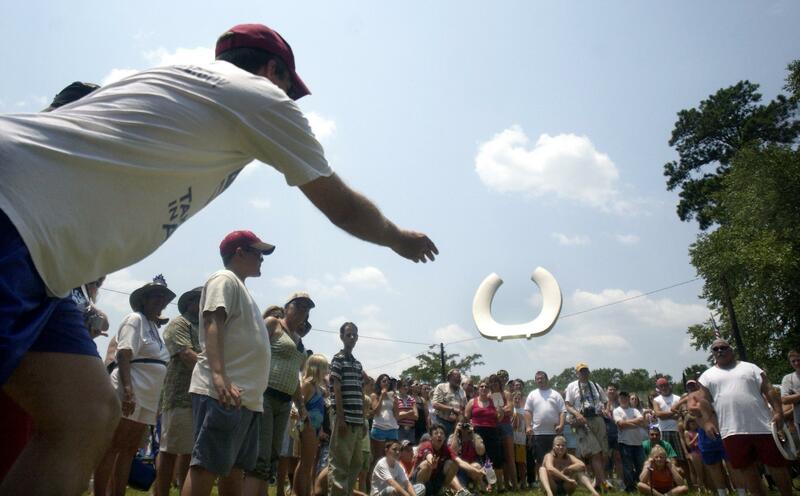 A man throws a toilet seat at the 2006 Redneck Horseshoes contest in Dublin, Ga.
Photo by Stephen Morton/Getty Images. Our efforts to dispel the mysteries of the modern visual landscape come to a head this week. For previous columns, click here; to submit your own suggestions, email us. Lovely. But where were we? That’s right: on the can. So, look down. Is the toilet seat U-shaped, like a horseshoe, with a gap in front? Or is it a continuous, O-shaped ring? If you’re in a public restroom, the seat is probably U-shaped. If you’re enthroned at home, you’re probably on an O-shaped seat. As a reader—willing to be identified only as “Laurie from Edmonton” and reluctant to comment on the record about where she reads Slate—asked in a recent email, what’s the deal with the U-shaped ones? Well, Laurie from Edmonton, there are many unsatisfying theories out there. Perhaps men are less careful in public toilets, “away from the restraining influence of their families,” some have said. The U-shaped seat might stay cleaner if the seat isn’t raised. (But who doesn’t raise the seat?) Maybe guys don’t want their business touching the seat away from home? But women’s restrooms have the same seats—and wouldn’t the same reluctance apply at home, albeit to a lesser degree? Perhaps people are (unnecessarily) afraid of catching STDs from public toilet seats. Or maybe U-shaped seats are somehow easier to clean. And then there’s the theory put forward by Pasha Malla at the Morning News: U-shaped seats use less material and so are cheaper to make and to clean. Even Wikipedia is sending mixed signals. In the online encyclopedia’s tome on toilet seats, the subsection on open front toilet seats also mulls various theories, e.g., that the U-shaped seat is ergonomically better. (How exactly? It’s not clear, nor is there any explanation why the same logic wouldn’t apply to home seats.) The next section states point blank that the reason for the U-shaped seat is to reduce “spatter” and make cleaning easier. None of these theories is quite right. The original purpose for the U-shaped seat, according to Lynne Simnick, senior director of code development at IAPMO—the International Association of Plumbing and Mechanical Officials—was to aid women. Simnick explains that the open seat was designed to allow women “to wipe the perineal area after using the water closet” without contacting a seat that might be unhygienic. There is a sensible exception to the Uniform Plumbing Code requirement. If a public restroom has an automatic toilet-seat cover dispenser, the seat doesn’t need to be U-shaped. For a good time, email your suggestions for future columns to whatisthat@markvr.com. Previously in What’s That Thing?